What do Bill Belichick defensive schemes, Tom Clancy novels, Google+ and Facebook have in common? The answer is that all are so byzantine that they leave many people scratching their heads to figure them out. For NFL playbooks and spy novels, such intricacies are the norm. Social networking should not be that way. The trouble is the latter is rapidly descending into a black hole of complexity that you now really do need one of those Missing Manuals to figure out the basics. With all of the news coming out of Google (s GOOG) and Facebook this week, our relationship with social networking sites has entered the dreaded “it’s complicated” stage. That’s a shame, since it’s simplicity that attracted us in the first place. Google’s minimalist interface and ability to execute a search exceptionally well is what catapulted it to the forefront. It made us quickly see just how bloated other services like Yahoo had become as they aimed to become portals. Now Google is a complex portal. Facebook, much the same, rose to prominence because it was just so simple compared to others. Back in 2007, author/pundit Jeff Jarvis praised its “elegant organization” as the nucleus of CEO Mark Zuckerberg’s genius. Now, however, the interface has grown a lot more complicated. It too is a portal. Today Google+ and Facebook are locked in a features arms race the likes of which we haven’t seen since Microsoft Word defeated Wordperfect back in the early 1990s. Both are rapidly adding buttons and gizmos to keep a fickle public in their grasp. On the one hand, some might see this as a smart move. History has shown us that no single community or social platform has had staying power more than a few years. Users get bored, new platforms emerge and there’s churn. Features encourage tighter connections, more sharing and increase the emotional switching “costs.” It can keep users in their fold – even the disgruntled. The flip side is that, in social networking, you can go too fast. People already are time starved. Adding new features that cause consumers to have to invest precious mental processing cycles to figure them out may have the opposite effect to what’s intended. I don’t fault the platforms for innovating. They have to. However, they should consider going a little slower and phase in new advances over time, rather than all at once. Be evolutionary, not revolutionary. Make some features “mandatory,” but allow users to discover the hidden delights. This is even more pivotal in social networking because of privacy. Already a lot of people fear that Google and Facebook know too much about them. As feature creep becomes the norm, both platforms are encouraging more sharing, not less. The problem is this requires that they add tighter privacy and sharing settings. While welcome, this only creates even more complexity and a vicious cycle ensues. Worse, they’re bucking the trend. In computing, Apple (s AAPL) has remained true to this approach its entire history. Microsoft (s MSFT) meanwhile, with its bold new Metro interfaces, is also aiming to make things simpler for users (Microsoft is an Edelman client). In social networking, Tumblr and Instagram are making inroads because they always keep things simple and elegant. They do a one or two things really well and they don’t rush. The same is true for mobile platforms like 37 Signals and Instapaper, both of which have eschewed bloat. Such bloat over time may have precisely the opposite intended result. It could drive users away rather than keep them closer. And it creates a distinct avenue for disruptive, elegant competitors to come along just as Google and Facebook did in their salad days to gain share. Steve Rubel is EVP/Global Strategy for Edelman – the world’s largest public relations firm. He tweets @steverubel. Image courtesy of Flickr user jasminejennyjen. It’s Complicated. This sums up the issue perfectly. When I was a freelance web designer I had so many requests to create sites similar to Google (when it was “just” a search engine). Now, it seems people are left scratching their head just trying to learn how to ‘engage’ – social media, huh? Social networks are complex by their very nature. The fact that you have put a whole social structure on top of a simple piece of technology does not make it any less complex. I believe that the real issue is that because these platforms don’t really understand the underlying social structural issues they are dealing with and because they are approaching this like engineers they have made it complicated. 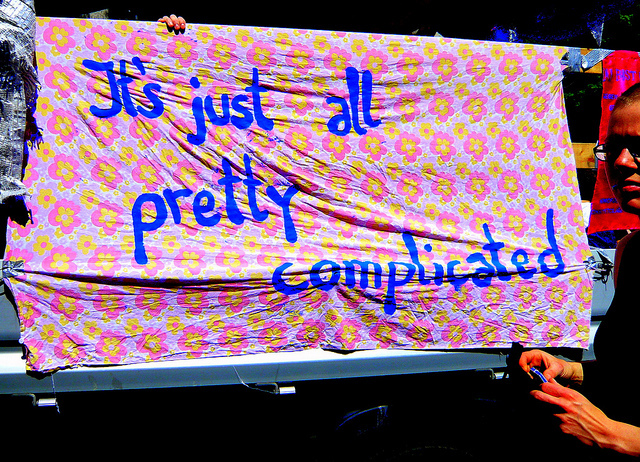 Here is a great Ted video that talks about complex vs. complicated – http://bit.ly/pize2g. Because they have done this they are now in a feature race. So we have created the “it’s complicated” phase. It will always be complex but it doesn’t have to be complicated. Microsoft Word did not defeat Wordperfect in the 1990’s in a features war. The defeat came from monopolistic, aka unfair, non-competitive business practices. Exactly right. I used to view FB as a company who made something that could have been very complicated into a product easy enough for hundreds of millions of people to use. The latest sets of changes (and the ones coming next week) have “Jumped the Shark” into an overly complicated experience. I completely agree with this article, BUT in my opinion I only see this complexity coming from facebook. I’ve been using google+ for a few days now, and my experience with it has been nothing but great. Its circles’ interface is very easy to use, and I think it solves a lot of facebook’s problems and I mean mainly privacy, and organization. At the moment though google is a empty. If they can get people to move then I think google has a gold mine on their hands. Steve, I couldn’t agree with you more. When even those of us who are passionate about following the social media industry have started to feel like keeping up with all the changes is too much work, imagine how the average user, who’s just trying to hang out with friends, must be feeling. Steve, I could not agree more. When even for those of us who love social media and innovation feel like keeping up with the latest new features is just too much work, imagine what the average user, who is on Facebook just to keep up with friends, must feel. This article is right on target. The changes (and challenges) of facebook are so time consuming…its already difficult to invest time on each of the sites…logging on and relearning sites is challenging and annoying. Thanks for the read! Completely agree, and due to linked or interdependent features and services this will even get more complicated in the future. Excellent summary of what a lot of people, I’m sure, have been thinking. SOCIAL. NETWORKING. IS. NOTHING. BUT. MARKETING. Nothing more, nothing less. All this BS “Social” thing is nothing but a way to mine people for free marketing research and an easy way to market things to people. Yup that’s why I like twitter too. Intuitive and simple, even fun. But it’s starting to get more complicated which is a mistake I think. Excellent post. Simplicity will always win. I do think though that googlesearch is still simple. Even though google portal is not. It was Steve Krug that coined the usability phrase “don’t make me think”, not Jakob Nielsen. You’ve lost your marbles. And 37Signals is a mobile platform? This is the convo I had this morning with the CEO of an Internet start-up — except that you’re much more eloquent than I was. Simplicity? That’s why I love Twitter.